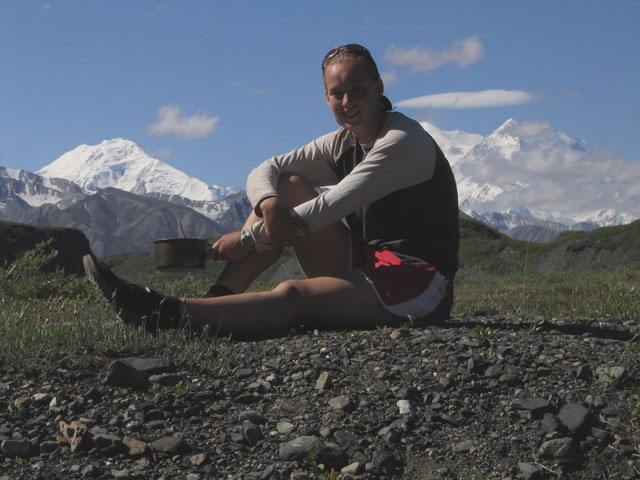 This is a picture of me in front of the Alaska range. More pictures. I recently completed my Ph.D in the Theory of Computation Group at MIT. My advisor was Madhu Sudan. In 2003, I married Eric Lehman and changed my name from April Rasala to April Rasala Lehman. Eric and I are now hiking the pacific crest trail. I received my B.A. from Dartmouth College in 1999. I'm interested in algorithms, optimization and information theory. Recently, I have been working on problems related to network coding. Network coding is a good example of the type of area that appeals to me. It draws on subjects traditionally studied in computer science (e.g. graph theory) but reconsiders them from a different perspective. I like the mix of fundamental questions and practical applications. For more information on what I've worked on, see my publications.